What is the best mattress topper for side sleepers? And how do you weed through the hundreds of options available on the market to find the best one for your sleeping needs? If you’re here today then chances are you’re a well-informed side sleeper who’s aware of the amazing benefits of sleeping on the right mattress topper and looking for the perfect model for a transformative sleep. Obviously, the option of splashing the cash on a brand new side sleeper mattress is something that doesn’t appeal to you for one reason or another. Well, there are thousands of mattress topper models available for sale right now and while salespersons may push whichever models their stores are stocking as the best for you, they may not always be the case. With the popularity of customer reviews online, you can always check out what current owners are saying about a particular model before ordering on Amazon. To make things easier for you, our team of experts has come up with the top 5 mattress toppers designed towards the needs of side sleepers in particular. All you have to do is simply analyze the features as well as pros and cons of each model to make the best choice for your needs. If you sleep on one or both sides of your body, finding the right mattress topper especially as a first-time buyer can be a very daunting experience. The good news is that you still stand a chance of becoming successful with the right education. In fact, there are critical factors you can’t afford to ignore, especially if you are serious about finding the very best model for your needs. The types of mattress toppers available for sale can be overwhelming so it makes sense to limit ourselves to the most popular ones available and highlight what each of them brings to the table. If you live in a more temperate climate or stuck with a regular mattress that sleeps too hot, a cooling gel mattress topper is recommended. These toppers are manufactured from either memory foam or another type of premium foam in combination with gel beads to bring significant cooling effects to the body. Latex Foam Mattress Toppers offer more bounce and extra support to the body. The downside is that they can be a bit too firm for those who prefer more comfort and tend to emit powerful odors during the first couple of days after unpacking. These are mattress toppers manufactured from goose feathers. They are fluffy and extremely soft on the skin, ensuring absolute comfort throughout the night. However, you may have to look elsewhere if you’re prone to allergies or looking for a mattress topper that offers a bit of extra support. Fiber toppers are a good option for consumers interested in an ultra-soft material without the allergies associated with models manufactured from feathers. Mattress toppers come with different price tags so it is up to you to settle on a budget and stick to it. Depending on the size you’re looking for, prices can range anywhere from $50 to just under $200. Density and firmness are a matter of preference. Most toppers range from 1-4 inches and usually, the thicker your body size, the denser the model you should purchase. Most slim people thrive on 2-3-inch toppers while those with bigger bodies tend to go in for 4-inch models. Keep in mind that denser toppers tend to be firmer so you may have to settle for a 2-3 inch model if you’re looking for an extra soft sleeping surface. Since side sleepers do better on softer mattress toppers, make sure you read the customer reviews of each model you’re interested in to find out how soft it is before splashing out on it. The ExceptionalSheets Bamboo Mattress Pad is the number one mattress topper for side sleepers who sleep hot. The elastic skirt is crafted to fit mattresses with depths of up to 18 inches and provides everything your body needs to get a revitalized sleep. The Plush rayon from bamboo cover offers cloud-like comfort and unrivaled support so it is no wonder that this topper is the go-to model for anyone looking for a soft, comfortable, durable topper with excellent breathability. Whether you own an innerspring, latex, or memory foam mattress, this topper fits without any problems. Each model contains RevoLoft, an amazing fiberfill that gives an authentic goose and duck down sensation minus the feathers, poking, or allergies. This material makes the topper so cool and cozy that you can actually feel it under your skin the moment your body makes contact. 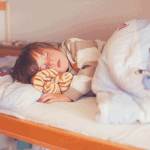 No matter how hard your day may have gone, you can arrive home to a deeply relaxing sleep. 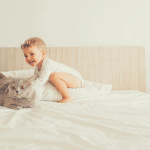 The Exclusive RevoLoft Fiber Technology doesn’t just provide an ultra-comfortable sleeping surface, it also delivers a topper which is highly resistant against allergies of all types as well as loads of potentially hazardous chemicals. The impressive 160 thread count cover enhanced with a double needle baffle box stitch is durable and designed to prevent the fill from shifting or moving around. This topper is manufactured by a company owned and operated by a United States Armed Forces Veteran. Ordering one therefore shows your support for one of our honorable Vets. 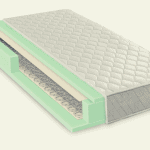 The LUCID 3-inch Gel Memory Foam is a popular mattress topper for side sleepers. The fact that it currently sits atop the Bestselling list proves it is packed with goodies that can make your sleep more enjoyable. It is a 3-inch ventilated gel memory foam model which provides overwhelming softness and pressure-relieving comfort no matter how out of shape your old mattress may be. LUCID applies a special memory foam formula which is extremely soft and airy even when room temperature spikes. Also, the foam is highly responsive to each sleeper’s distinct body shape, ensuring that pressure points are not overloaded with body weight while asleep which can result in severe soreness upon waking up. Like many of LUCID’s products, this mattress topper is available at an amazing price which is significantly lower than models from rival manufacturers. It is probably the best cheap mattress topper for a side sleeper right now. 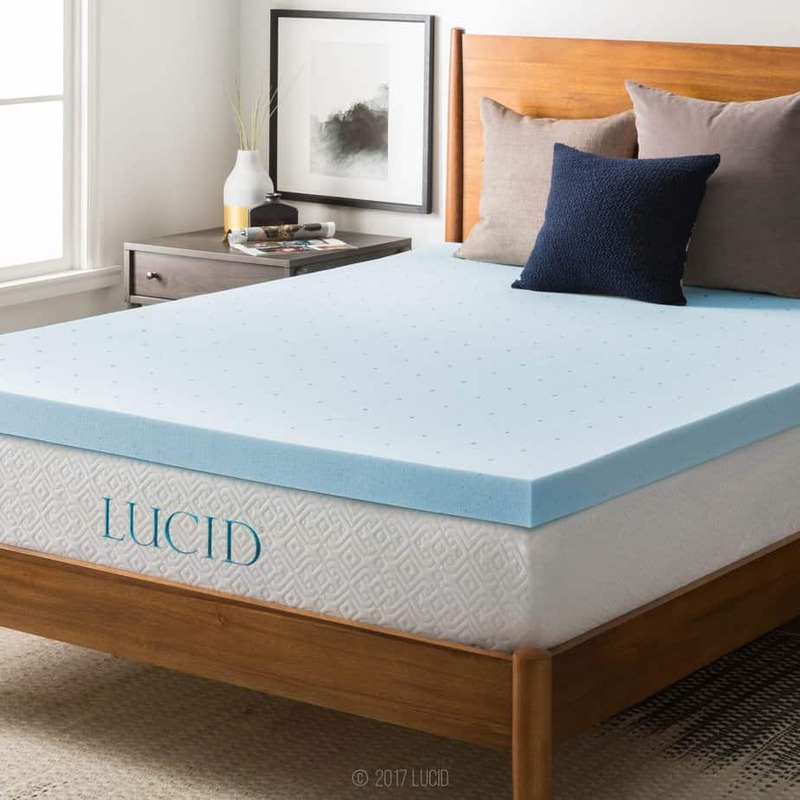 The LUCID 3-inch Mattress Topper is infused with ultra-cooling gel memory foam which smartly captures and distributes body heat to prevent overheating during sleep. The specially ventilated design also supercharges airflow via hundreds of uniformly sized and shaped holes which provide no barrier against the flow of air throughout every part of the mattress topper. It is recommended for side sleepers, especially those with delicate medical conditions and pregnant women who are desperate for soothing cradling sleeping surfaces in the absence of pillows. The Sleep Innovations 4-inch is another quality mattress topper engineered to meet the special needs of side sleepers. If you’re tired of resting on an exhausted mattress night after night and looking for a more luxurious sleep without paying top dollar, this model should come to mind. Made from the most adaptive and inventive foam bedding in the industry today, this topper responds to your needs with precision. This means you don’t need to worry about how you live and sleep. Sleep Innovations recognizes the importance of making a highly dense topper from the most innovative materials to counteract the effects of side sleeping. 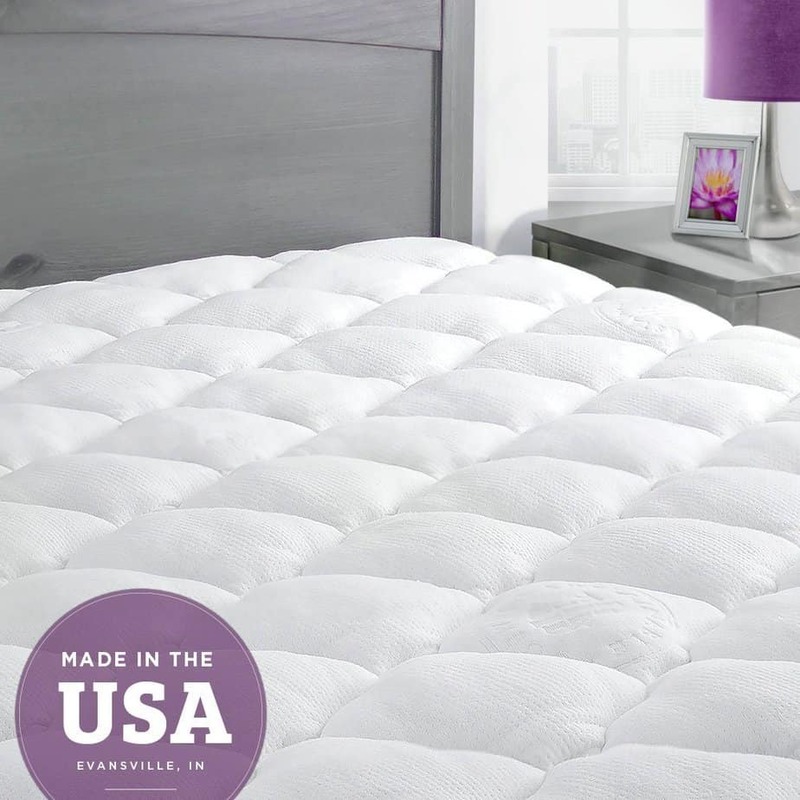 The perfect blend of a 2-inch cooling gel memory foam with 2-inches of fluffy fiber-fill therefore results in an amazing 4-inch mattress topper which can transform your sleep. Gentle, pressure relieving support is offered to everyone from side to back and stomach sleepers. Just make sure you don’t sleep through your alarm and arrive late at work. The Sleep Innovations 4-inch Mattress topper delivers a heaven-like sleeping experience at a price you can afford. 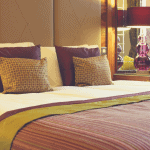 Who says 5-star luxury always requires breaking the bank? It is manufactured by a team of experts who have been studying people, the human body, and sleep for over 2 decades. Products are therefore refined to meet the needs of consumers and then some. Every inch of foam is manufactured right here in the United States and the quality of components means it stays in shape throughout a lifetime. Why do you think the manufacturer is confident enough to back each purchase with a 10-year warranty? The Best Price Mattress Topper gives you a similar feeling to buying a brand new mattress at a knockdown price. If your old worn out mattress leaves you feeling sore each morning, it’d be insane not to pay attention to what this topper has to offer. Are you desperate to finally sleep on a surface which feels incredibly comfortable? Well, this model is manufactured from body-conforming memory foam with an insane ability to quickly adjust to each sleeper’s unique curves. If your relationship is under a lot of strain because neither of you is able to sleep due to regular tossing and turning, the Best Price Mattress Topper could do wonders for your peaceful co-existence. Thanks to the built-in responsive active suspension, motion transfer is isolated and reduced so one partner doesn’t disturb the other. Also, the foams used have been certified by CertiPUR-US, an accredited, independent testing laboratory to meet the most stringent standards for content, emissions, and durability. Zero chance of coming into contact with potentially harmful manufacturing chemicals due to the use of CertiPUR-US certified foams. The Best Price Mattress Topper features a 2.5-inch High Density foam and 1.5-inch memory foam meaning absolute comfort for everyone especially those with bigger bodies. The polyester mesh cover is gentle on the skin and translates to a deeper sleep. The fact that it is zippered also means it can be easily removed for washing. The manufacturer offers a 5-year warranty for each purchase, which is evidence of the commitment to ensuring customers get genuine value for their dollars. The Milliard 2-inch Egg Crate Ventilated Topper is highly recommended for not just side sleepers but those who prefer other sleeping positions as well. It delivers a flawless combination of support and comfort to help you sleep tight. It contours perfectly to each individual sleeper’s unique curves to help provide relief from stress, joint pain, muscle pain, and even arthritis. Sleeping on the side puts enormous pressure on areas such as the neck, hips, and shoulders which can become sore over time. Thankfully, the Egg-Crate material eliminates sore spots in those troublesome areas, ensuring that you can sleep comfortably and wake up with minimal pain. The use of premium memory foams is another reason why this model has become so popular among consumers from different walks of life. The foams are constructed with advanced high-density technology which guarantees that the topper stays in shape after many years of heavy usage. The Milliard Egg Crate topper is manufactured from open-cell technology and infused with an endless number of ventilation channels to significantly increase air flow and regulate sleep temperature. This model instantly makes your old mattress more comfortable, restful and supportive. Why waste money on a brand new mattress when you can pay a small fraction of the amount on this topper? The Milliard Egg Crate is simply more than a mattress topper for a side sleeper. It improves your overall sleep quality which results in enhanced health and higher quality of life. The importance of a deep, restful sleep cannot be overemphasized and this is why many consumers are searching for the right sleeping accessories to meet their needs. 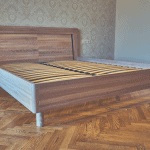 The ExceptionalSheets Bamboo Fitted is hands down the best mattress topper for side sleepers and our number one pick. However, the Sleep Innovations 4-inch and LUCID 3-inch are equally awesome alternatives that can transform the quality of your sleep. Just decide which one best meets your needs and buy with confidence.